【Abstract】In the 20 years since Hong Kong’s handover, its economy has accumulated many deep contradictions and problems that are more serious than those of other developed areas. This article analyzes the causes of these problems and proposes solutions. It studies the strengths and weaknesses of Hong Kong’s competitiveness, and discusses how Hong Kong can capture the opportunities offered by China’s rise, taking advantage of China’s “Belt and Road” Initiative and the development of the “Guangdong-Hong Kong-Macao Greater Bay Area,” and capitalizing on the strengths of Hong Kong as a global hub of international finance, trade, and services, and as a platform to project and develop China’s “soft power”. 【Abstract】In view of the tremendous change in the modern era and our society, the employment mode of Hong Kong youth has changed significantly, and education development is also being affected. The traditional education system has gradually become obsolete. The article also reviews educational reform over the past 20 years, elaborating upon its aims and vision. A blueprint for education development in Hong Kong in the twenty-first century is also discussed. 【Abstract】The Hong Kong Special Administrative Region Government mapped out Hong Kong’s Climate Action Plan 2030+ in response to the Paris Agreement. The plan attaches importance to the active participation of young people through an interactive, collaborative, and innovative way to mitigate climate change. The government is working closely with the youth in the acceleration of the low carbon transition with a view to changing habits and customs in such areas of daily life as dining, clothing, housing, and commuting. 【Abstract】Drawing upon territory-wide surveys on Hong Kong identity conducted between 2006 and 2016, this article examines the changing identity affiliation to China of Hong Kong youth. The data indicate a decline in the cultural articulation of Chinese identity since 2012. The surveys further indicate that while Hong Kong youth feel a connection to the Mainland Chinese, cultural changes are affecting their impression of the latter. This shifting impression is consistent with their cultural alienation from China. 【Abstract】Youth is an important demographic, and also represents the key to Hong Kong’s sustainable development. A visionary and comprehensive youth policy (or youth development strategy) could provide extensive support to young people and their development. Ideally, it should offer a unified narrative for youth development, provide a frame of reference for policymaking and evaluation, and lay down an action plan for the next five to ten years. It should aim to build a more equitable and inclusive society, while also showing our investment in our future through showing that we, as a society, care about our young people. 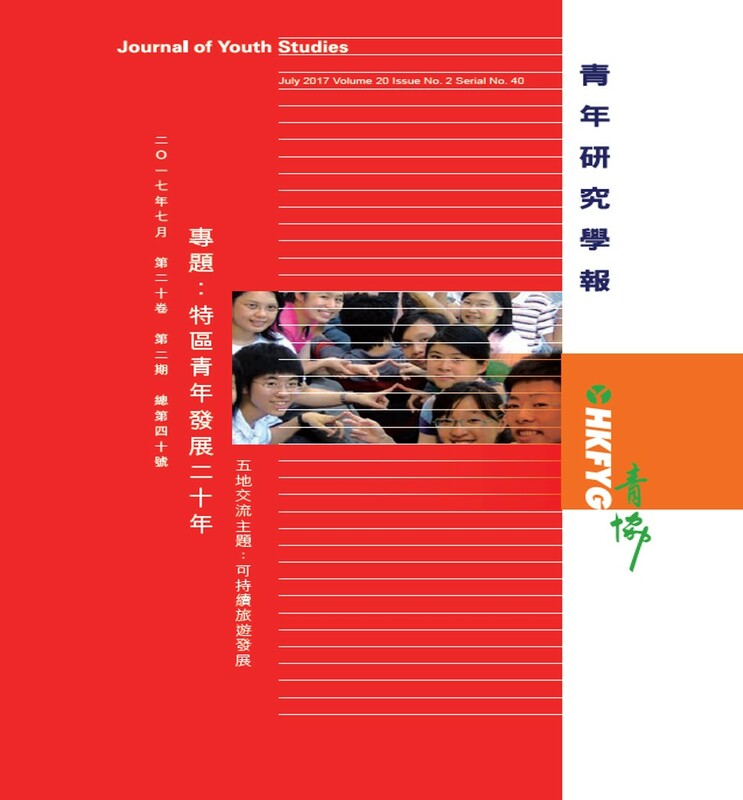 This article reviews historical and recent developments in Hong Kong, sets out a theoretical framework a youth development policy or strategy, and, through examining the current issues facing Hong Kong youth, proposes suggestions for a model, approach, principles, and strategic directions. 【Abstract】A majority of the youth in Hong Kong expresses a desire for home ownership upon marriage, but this dream is obstructed by the tightened regulation of mortgages, a minimal supply of publicly subsidized housing for sale, and the precarity of the labour market. The consequences of obstructed home ownership among young people include falling quality of life, change in family relationships, postponement of marriage, low fertility, squeezed consumption, and reduced lower-class mobility. Increasing the supply of subsidized housing may help to some extent, but alternative solutions, such as allowing withdrawals from the Mandatory Provident Fund Schemes to pay for home purchases, raising taxes on property owners, increasing subsidies or relaxing mortgage credit for buyers, may not help the situation or may be politically difficult to implement. 【Abstract】Today opportunities to move up are not as abundant as they were, although young people in Hong Kong have generally improved their academic qualifications. It is necessary for Hong Kong to improve youth competitiveness. Research has shown that soft skills have considerable implications for sustainability. High technology replaces mechanical duties but not the communication and coordination skills which are crucial in the workplace. To enhance youth competitiveness, this article discusses the soft skills training necessary to equip young people to adapt the challenges in their future career. 【Abstract】This paper aims to provide constructive criticism of Hong Kong’s elite sport policy. It will examine the key factors to successful elite sport promotion with the support of foreign cases. These factors could potentially serve as important foundations for Hong Kong to develop its sport at the elite level. This paper will also evaluate the HKSAR Government’s previous achievements in this area within the last two decades, which are significantly limited due to insufficient financial investment, lack of training, psychological, rehabilitative, and flexible learning support for athletes, and failure to detect potential elite athletes. 【Abstract】This article seeks to explore the relationship between nonstandard employment and youth social mobility in Hong Kong. Through in-depth interviews, we find that youth in temporary and part-time employment can prevent downward mobility in their living standards by combining income from multiple jobs. Self-employed workers, on the other hand, can receive a greater return from their labour and develop diversified businesses for upward mobility. Nonstandard employment can also match the “non-mainstream” mobility aspirations of some young people and allow them greater autonomy in the pursuit of non-materialistic life interests. 【Abstract】This article reviews social movement and youth participation in Hong Kong in the post-handover era. It captures the trend of a correlated rise in both youth activism and social movement. While this can be explained by political process theory, its mode of organization is relatively incompatible with traditional theories, such as resource mobilization theory, due to the major role played by social media in mobilization and communication. There are two key important messages for policymakers. First, in the age of Web 2.0 and cyberactivism, under the effect of the logic of connective action and the personalization of collective action, social media has transformed both youth activism and social movement by rendering them more individual-based, leaderless, and organizationless. Second, in response to this new mode of youth participation, policymakers must co-evolve with the new generation by adopting a new policy paradigm in engaging the youth. 【Abstract】“Mentor” is a term commonly used in startup competitions. Are mentors vital to startups? Mentors, they have been there, done that, and have seen it all. Yet a woeful number of entrepreneurs start their business without one. Most successful tech titans were founded by people who had mentors. Facebook’s Mark Zuckerberg was mentored by Steve Jobs. Jobs was mentored by Mike Markkula – an early investor and executive at Apple. Eric Schmidt mentored Larry Page and Sergey Brin of Google. Do startups need a mentor? What role does a mentor play? This article reviews the impact a mentor can have on startups and provides guidance for both mentor and mentee. 【Abstract】Sustainable tourism is a complex concept that can be understood in different ways. This article first reviews the discussion of this concept in the Chinese and Western literature. It then investigates the difficulties encountered during the promotion of sustainable tourism when different stakeholders are involved, as well the concept’s applicability in Hong Kong. Finally, issues of environmental justice are raised for further discussion. 【Abstract】Issues of sustainable development and tourism are explored in this paper with particular reference to the South East Asian city-state of Singapore. It is argued that Singapore’s success as an international tourist destination can be partly explained by effective urban and other forms of planning. General policies are increasingly guided by principles of sustainability which also inform the operation of the tourism industry and visitor experience. Although this modern and highly urbanized small republic may not conform to common perceptions of sustainable tourism in practice, there is evidence of endeavours to make progress in the field. Nevertheless, economic priorities tend to prevail and there are uncertainties about future directions and longer-term prospects. 【Abstract】The development of rural tourism in our country is in the early stages, so there are severe contradictions between stakeholders in the development process. The root of this issue is the imbalance of interests between different stakeholders. In balancing these interests, notably those of the company developing tourism and villagers, non-governmental organizations can play the role of coordinating relief. Therefore, based on stakeholder theory, this study discusses the role of non-governmental organizations in rural tourism development through field study, literature review, and interview, with cases including Panyu Shawan and Lai Chi Wo in Hong Kong. 【Abstract】Forest parks offer carbon sequestration, scenic services, and ecotourism. Community-based ecotourism can maintain the local economy, protect the natural habitat, and boost tourism developed out of unique local cultural flavors based on the foundation of sustainable development. This study incorporates community-based ecotourism into management strategies for forest parks, and explores the characteristics and features of ecotourism in Taiwan. The conclusions of our paper offer new insights for establishing community-based ecotourism management programs in forest park areas. 【Abstract】This study identified the various farming activities carried out by Nigerian youths and documented emerging trends in their involvement in agriculture with a view to ascertaining their level of involvement in adding value to agricultural produce in Akoko South-West local government area (LGA), Ondo State, Nigeria. A simple random sampling technique was used to select 120 youths in 12 communities within the LGA through a questionnaire and interview schedule. A Binary logistic regression was used to make inferences. The results showed that the mean age of the youths was 34±11 years and the mean annual income was ₦265,280.00±21.159. The youths were found to be involved in both crop and animal production, with about 52.7 per cent having a high level of involvement. The majority (97.4%) of them were only involved in the production of crops and animals; only 32.8 per cent and 15.7 per cent were involved in packaging and adding value to produce, respectively. It was observed that the youths with a secondary education (b = -1.76) and a first degree (b = -1.609) had a negative disposition towards agriculture; only those with a diploma education (b = 1.609) had a favourable disposition towards agriculture. It was concluded that youth involvement in agriculture is taking on a new dimension in terms of value addition and packaging. It is therefore recommended that educational institution curricula should be tailored in line with global practices in agriculture in order for Nigeria to become self-sufficient in food production.